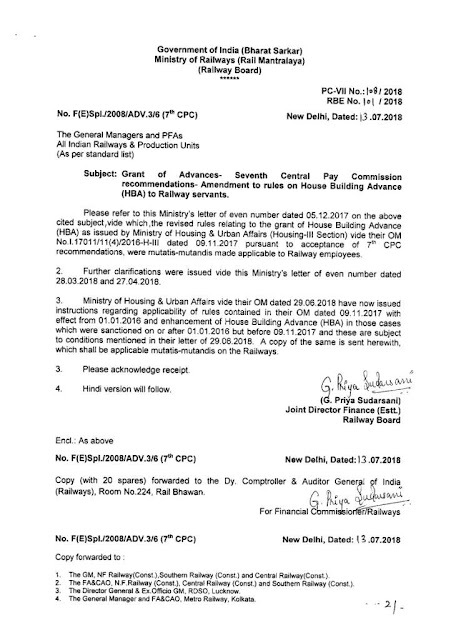 Subject : Grant of Advances – Seventh Central Pay Commission recommendations – Amendment to rules on House Building Advance (HBA) to Railway servants. Please refer to this Ministry’s letter of even number dated 05.12.2017 on the above cited subject,vide which, the revised rules relating to the grant of House Building Advance (HBA) as issued by Ministry of Housing & Urban Affairs (Housing-III Section) vide their OM No.I.17011/11(4)/ 2016-H-III dated 09.11.2017 pursuant to acceptance of 7th CPC recommendations, were mutatis-mutandis made applicable to Railway employees. 2. Further clarifications were issued vide this Ministry’s letter of even number dated 28.03.2018 and 27.04.2018. 3. Ministry of Housing & Urban Affairs vide their OM dated 29.06.2018 have now issued instructions regarding applicability of rules contained in their OM dated 09.11.2017 with effect from 01.01.2016 and enhancement of House Building Advance (HBA) in those cases which were sanctioned on or after 01.01.2016 but before 09.11.2017 and these are subject to conditions mentioned in their letter of 29.06.2018. A copy of the same is sent herewith, which shall be applicable mutatis-mutandis on the Railways.